Two updates have been made to the Parameter Bonuses script. When you add bonuses to an actor, the bonus will always be applied. However, sometimes you want bonuses to be activated under certain circumstances, such as wearing a piece of armor or applying a state. By note-tagging parameter bonuses to different database objects, you can create all kinds of equips and states with unique functionality. And whenever the state is applied, it will increase the battler’s atk by the amount of atk it currently has, effectively doubling its atk. In addition, the formulas have been upgraded to allow you to reference the object’s attributes. This means that you can directly reference a weapon’s original atk, or an armor’s original def, or maybe the price of an item. 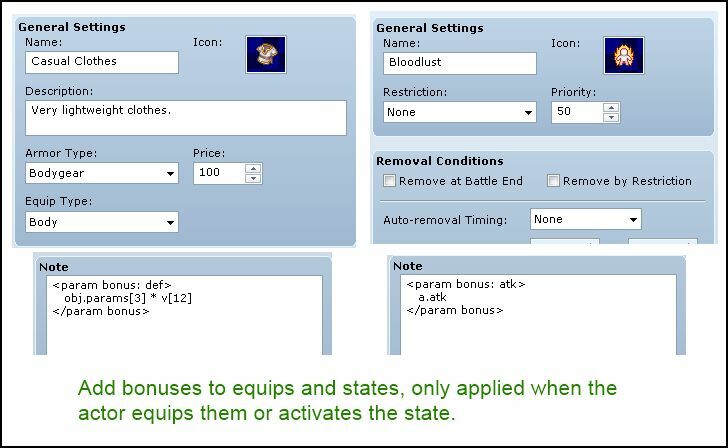 Essentially, you can access any attribute on any objects that the bonuses are attached to, including additional attributes added by other scripts. Could this be used in conjuction with affixes? What I mean is, let’s say I have a suffix “of the Bear”. Now, said suffix improves MaxHP by 10% and Defense by 10%. What I’d like is to have the suffix base itself off the stats of the armor it is being attached to, rather than the stats of the actor. So, if you had an Iron Helmet of the Bear, which gives you 10 HP and 4 Defense normally, it would instead give you 11 HP and 4.4 Defense. But, if you had a Steel Helmet of the Bear, which instead gives you 20 HP and 8 Defense, the suffix would change it so you are receiving 22 HP and 8.8 Defense.